Notice how the stripes match fairly well, until the colors suddenly diverge, about 2/3 way of the instep. There wasn’t a knot in the yarn; it just changed, a very long pattern repeat, I guess. 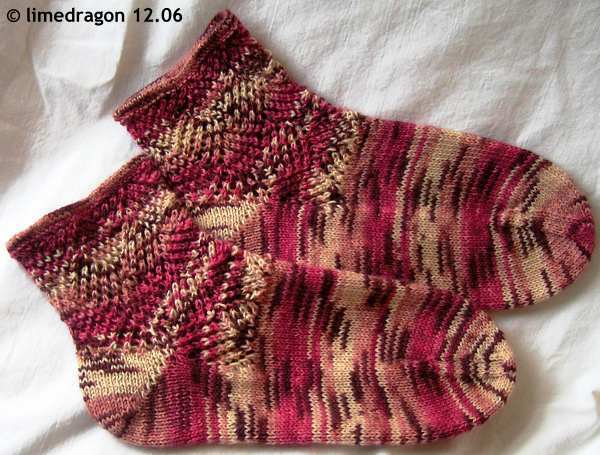 And, just for fun, here’s a photo of all the gift socks before I mailed them off a few days ago. Clockwise from top left: Railroad Rib in Tiger, Little Shells in Ladybug, Maple Leaf in Owl (this was an extra pair I knit pre-blog early in 2006 for just-in-case), Negative Bricks in Parrot, and the Hippy Crunchy in Flamingo. Farewell and wear well, zoo socks! Now, as for Christmas… it was nice, lovely, and simple. 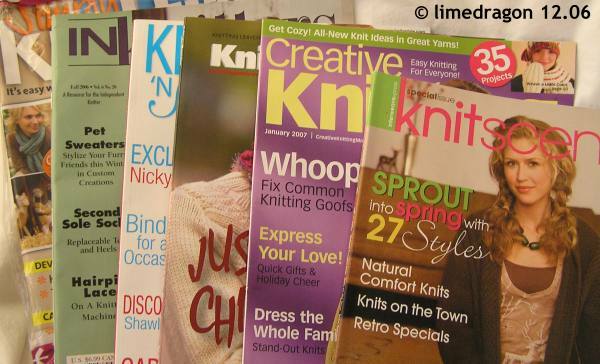 I didn’t get any yarn, but I did get a ton of knitting books and magazines, so it was a lot of fun to browse through them. Clockwise from top left: Poetry in Stitches, Designing Knitwear, Vintage Knits, Folk Socks, Knit 2 Together, and And So to Bed…. I also got a digital kitchen scale, which has already helped me in dividing up a skein for a future project, some mystery and fantasy books, an alkaline-powered screwdriver, and the Murder on the Orient Express game. I can’t wait to play this. However, I need to finish And Then There Were None first, which I received last Christmas, yikes! Oh, I love that book! When I was in 6th grade, we read it and I just fell in love with it. I love your sock labels! I see you got a lot of good knitting reading! 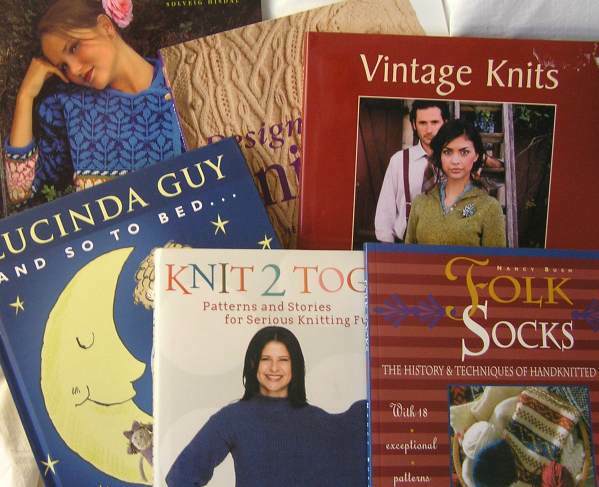 I have three of those books, Vintage Knits, Designing Knitwear and Poetry of course. All excellent! The others look intriguing as well. Enjoy! 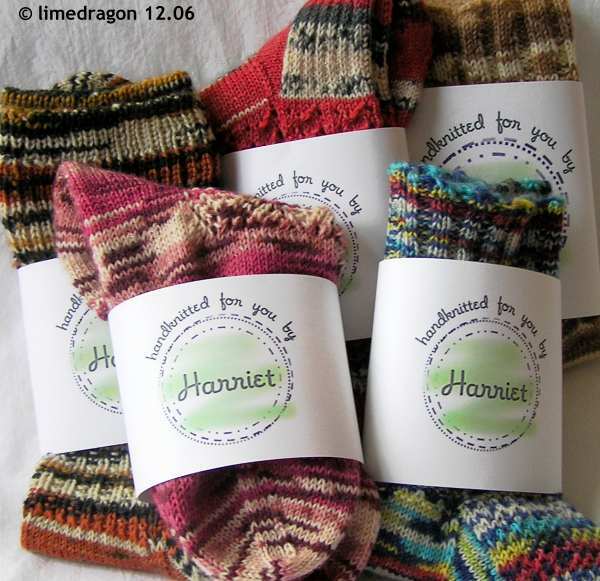 Your sock labels are so cool, how neat to have your own logo! Your socks all turned out so well! And wow, I bet your bookshelves are bursting. Yowza. :) Love my digital scale, too. I love your labels! I wish I had something like that for my handknits. What program did you use to design the labels?